The lighthouse, Faro Cabo Villano Camariñas, is one of Galicia's more impressive and larger lighthouses and we visited it back in 2012. At the time we were just taking a drive along this part of the coast and we spotted the lighthouse whilst we were somewhere around Camarinas. Although we first saw the lighthouse from a distance, it did take a little bit of finding. 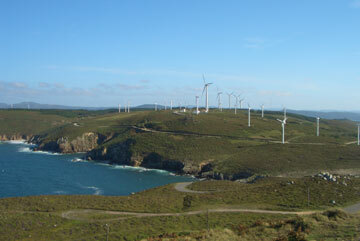 It is situated next to some kind of fisheries complex and there is a big wind farm around it – although that is true of much of rural Galicia. Although I have a friend in Filey who is a lighthouse fanatic, I know very little about them. The lighthouse tower sits atop a large rocky outcrop with the lighthouse building constructed separately below and to the side of this outcrop. As you can see from the photo, this lighthouse is quite spectacular and, although you cannot walk up to the actual tower, you can go into the visitor centre (the white building below). There is a small car park for the visitor centre and you drive up quite a steep incline with a fairly sheer drop to your right to reach it. If you do not like heights (like me), beware. Once at the centre, admission is free and you can wonder around and see a mix of old lighthouse artefacts and engineering equipment in one room. Another room has pictures and information about the lighthouse (although not in English), and a further room acts as a café. There is also an information desk and, if my memory serves me correctly, the lady who was there at the time spoke some English. You can pick up a couple of leaflets about the lighthouse, but again only in the native tongue. In addition to the lighthouse visitor centre, there is also a path that leads up to an elevated plateau offering good views of the lighthouse and the surrounding coast. The photo of the lighthouse tower on this page was taken from this spot and it is from this position that the sea farm is visible on the opposite side. 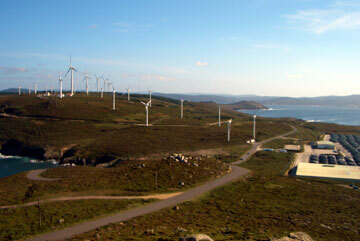 The photos on this page show, top - the lighthouse tower with the visitor centre (white building) below, centre - the craggy coastline and windfarms around the lighthouse, bottom - the sea farm and more windmills. Here is another lighthouse in Galicia. 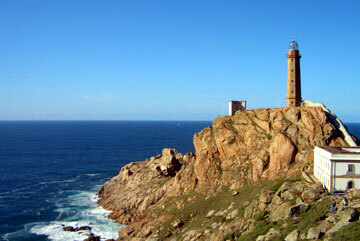 This one is the lighthouse near Corrubedo sand dune and beach.